It was initially thought (and hoped) that the plant might transit in front of Beta Pictoris, providing a unique opportunity to learn the radius of the planet and thus understand the size of the atmosphere. Unfortunately, the geometry of the planet’s orbit doesn’t quite line up in a way that would have the planet pass in front of the star from our point of view. Astronomers using the Atacama Large Millimeter/submillimeter Array (ALMA) have made the first high-resolution image of the cometary belt (a region analogous to our own Kuiper belt) around HR 8799, the only star where multiple planets have been imaged directly. 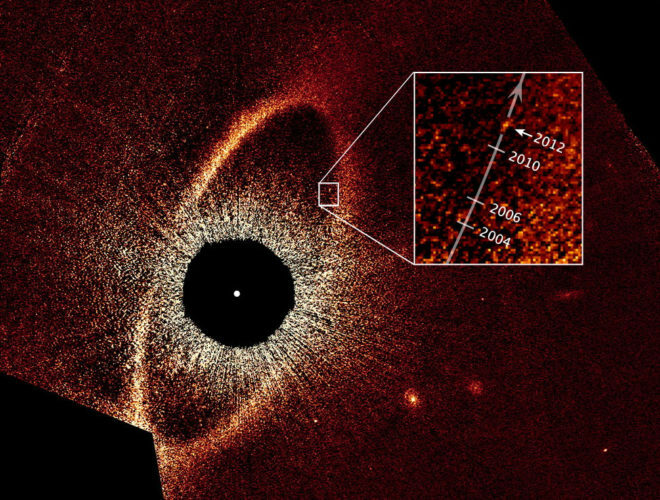 The shape of this dusty disk, particularly its inner edge, is surprisingly inconsistent with the orbits of the planets, suggesting that either they changed position over time or there is at least one more planet in the system yet to be discovered. The disk, which fills a region 150 to 420 times the Sun-Earth distance, is produced by the ongoing collisions of cometary bodies in the outer reaches of this star system. ALMA was able to image the emission from millimeter-size debris in the disk; according to the researchers, the small size of these dust grains suggests that the planets in the system are larger than Jupiter. Previous observations with other telescopes at shorter wavelengths did not detect this discrepancy in the disk. It is not clear if this difference is due to the low resolution of the previous observations or because different wavelengths are sensitive to different grain sizes, which would be distributed slightly differently. HR 8799 is a young star approximately 1.5 times the mass of the Sun located 129 light-years from Earth in the direction of the constellation Pegasus. “This is the very first time that a multi-planet system with orbiting dust is imaged, allowing for direct comparison with the formation and dynamics of our own Solar System,” explains Antonio Hales, co-author of the study from the National Radio Astronomy Observatory in Charlottesville, Virginia. These results were published in the Monthly Notices of the Royal Astronomical Society titled Resolving the Planetesimal Belt of HR 8799 with ALMA by Booth et al., May 2016. The research team was composed by Mark Booth (, ), Andrés Jordán (, ), Simón Casassus (, ), Antonio S. Hales (, ), William R. F. Dent (), Virginie Faramaz (), Luca Matrà (, ), Denis Barkats (), Rafael Brahm (, ) Jorge Cuadra (, ).